While most birds are loved by man, pest birds represent a significant and ongoing problem. According to the FAA, bird strikes cost civil aviation almost $500 million a year. Keep in mind that just one bird can destroy an expensive jet engine in just seconds. The fact is, bird strikes on military airfields endanger our troops, can jeopardize the mission and ruin equipment. It's easy to see why many people look for ways to scare birds away. Growers don't much care for pest birds either. Native and non-native bird species have been known to cause crop losses in vineyards--typically 30 percent to as much as 100 percent. Pest birds can quickly devour seeds and ripening fruit. Many growers pull out all the stops to scare birds away. In the cities and urban areas, pest birds can wreak havoc with building facades, statues, schools, public playgrounds and parks. Bird droppings can destroy the paint on cars and buildings. They leave an unsightly mess and can carry a number of communicable diseases. Diseases transmitted by birds include aspergillosis, salmonellosis, thrush, avian tuberculosis, coccidiosis, cryptococcoses, encephalitis, histoplasmosis, Newcastle disease, toxoplasmosis and West Nile virus. No wonder so many municipalities have spent considerable sums of money to scare birds away. 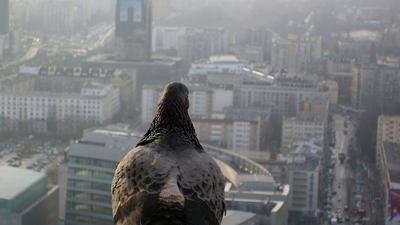 The feral pigeon is by far the most prolific urban pest bird in the world. Originally descended from the domesticated rock dove, they are now wild and live in close proximity to man. Feral pigeons are scavengers, scrounging for food in cities and town centers, where they are often eagerly fed by the general public. Feral pigeon populations are on the rise due to a lack of natural predators, the constant supply of food and their ability to breed year around. Other pest birds include the house sparrow, the starling and the gull. Gulls are scavengers and feed from scraps of food in town centers as well as sewerage outlets and domestic garbage dumps. Starlings often gather in huge flocks where their droppings ruin structures and monuments. Small but still a nuisance are sparrows, which often clog rain gutters and downspouts, and frequently cause electrical equipment shorts and fires. To scare birds away without harming them can prove to be quite a challenge. Fortunately, there are a number of pest bird deterrents that are available to humanely discourage birds from landing, roosting and nesting. For pigeons and large birds, consider the use of the highly effective Bird Spike strip. Harmless to birds, the intimidating spikes simply discourage birds from landing. Some bird spikes are made of stainless steel, others use rigid unbreakable polycarbonate spikes (the poly spikes are less expensive). For flat even areas, the Bird Spider has proven its worth as an effective pest bird deterrent. The spindly spider arms whip around in the wind to scare birds away. Spiders come in several diameters to deter various bird sizes. Harmless to birds, spiders are easy to maintain and easy to install. Similar to the spider, the motorized whirly-gig utilizes rotating arms to scare birds away. Ideal for parapet walls, roofs, signs, and billboards, some of these products are powered by batteries and others are even powered by solar energy. Next up are the growing number of balloons and banners of iridescent reflective foil and shiny tape, which create an “Optical Distraction Zone.” Some of these bird scare products feature lifelike reflective predator eyes. Others have "day-glow" backsides to scare birds away at night. One of the many things that make these bird scare products so appealing is their low cost and easy installation. They're ideal for use on boat docks, pool areas, overhangs, gazebos, and other troublesome areas. We know people get irritated whey they walk across a carpet, reach for a doorknob and get shocked. It's the same with birds. Electric Shock Bird Repellers have been used for years to scare birds away. Ideal for pigeons, seagulls and larger birds, these electrified tracks mildly zap birds that try to land. Easily mounted on ledges, signs, rooftops, and flat or curved surfaces, many electric tracks have a low profile tracks, so they can't be seen from below. While screaming at birds or blasting loud horns can scare birds away, there are bird deterrents that use ultrasonic sounds that annoy birds--annoy them enough to discourage them from landing. These audio deterrents imitate distress calls and predator calls. They're ideal for enclosed areas like parking garages, overhangs and sheds, where pigeons, sparrows, starlings or seagulls sometimes gather in flocks. Farmers and growers have long used this next category of bird deterrents to scare birds away. Known as Foggers or Misters, these disperse a food-grade, non-lethal aerosol of methyl anthranilate. The chemical has been approved by the EPA and won't harm birds. It simply irritates birds that fly through it, convincing them to avoid the area. Some misting systems feature multiple remote spray nozzles to allow specific areas to be treated and pinpointed.